People start getting excited for Halloween in late summer, planning their costumes and thinking about the candy they’ll need for October. You can buy everything you need in September, but then you’re stuck looking at all your Halloween candy for another month, knowing the trick-or-treaters won’t be pleased if you eat it all yourself. But perhaps you simply haven’t thought of all the possibilities for your Halloween candy this year. Halloween-themed candies make perfect gifts or party favors, and they are sure to delight children and adults alike. But what kind of activities should you host, what kind of candy should you get, and how should you present it? Firstly, you might want to invite your friends over a few times during October for board games. Or perhaps your children would like to get together with their friends and classmates for pizza. These are both great opportunities for presenting unique Halloween candy to your guests. May we suggest Halloween lollipops as the candy of choice for these events? Halloween lollipops will work great because they are unusual and, better yet, delicious! 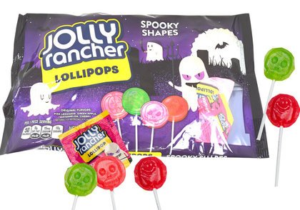 Pumpkin Pops are orange jack-o-lanterns with creepy white faces, while spooky-shaped Jolly Rancher lollipops feature designs of ghosts and skeletons. For an especially striking Halloween party favor, you’ll want to check out some Halloween rock candy sticks, available from Blair Candy. Each jar comes with 35 individually wrapped lollipops in vibrant Halloween orange and black. We love Halloween lollipops because you simply don’t see them that often, and yet they are as mouthwatering as any other Halloween candy. You can order yours at BlairCandy.com.